The friendly picture of hardworking friends and family sharing genuine kinship and the American Dream around a merry hearth fire made its way into this late 1800s classic. In the spirit of Jane Austen’s eternal words, it is a truth universally acknowledged that a single child in possession of two doting parents must have been dragged off to unwillingly watch The Nutcracker on Christmas eve and walked away entranced by the performance. Most of these children probably even entertained budding dreams of becoming ballerinas only to have those hopes mercilessly crushed at an after-school gymnastics program. Stemming from that needlessly specific flashback, the Joffrey Ballet’s performance of The Nutcracker last Saturday was infused with nostalgia and marbled with contemporary twists that humorously adapted the traditional performance to a 21st century audience. Choreographed by Christopher Wheeldon, The Nutcracker was set during the World’s Columbian Exposition of 1893, a decision I thought was fantastic. It directly touched local audience members who felt kinship over the familiar setting—their own Windy City. The newspaper backdrop with headlines proudly announcing the Chicago World’s Fair not only excited the children in attendance with flashy lights around a recognizable name but also appealed to adults as an interesting rework of a classic. Naturally, choosing a different setting for the ballet also involved changing the characters and their socioeconomic statuses. Instead of keeping Marie’s (originally Clara’s) family in an elite upper class, Wheeldon transformed them into a working class, immigrant family in order to demonstrate the crucial role immigrants played in building Chicago. In this way, the friendly picture of hardworking friends and relatives sharing genuine kinship and the American dream around a merry hearth fire made its way into this late 1800s classic. In addition, the political implication did not pass over the crowd’s head but was well received. Moreover, Wheeldon’s Nutcracker was child-friendly both behind the curtains and on stage. The delighted squealing of children in the crowd was audible after several of the funnier scenes, such as ones including the tricky walnuts or the comically crazy Buffalo Bill. Onstage, the production itself shined a spotlight on child ballerinas. The walnuts drew laughs from young and old alike as pea sized soldiers cut pea-sized walnuts apart in cute synchronization. One walnut and soldier pair especially pleased the crowd with their Tom and Jerry antics that eventually ended with the walnut running away from its mini soldier counterpart. Junior snowflake dances were synchronized in funny and captivating sequences, which couldn’t help but make me wonder how difficult it must have been for kids of such age to exhibit such disciplined performance. It was simultaneously impressive and adorable. The only aspect of Wheeldon’s Nutcracker that failed to impress me were the cultural scenes when Marie is exposed to the world outside of Chicago through several exotic exhibits. 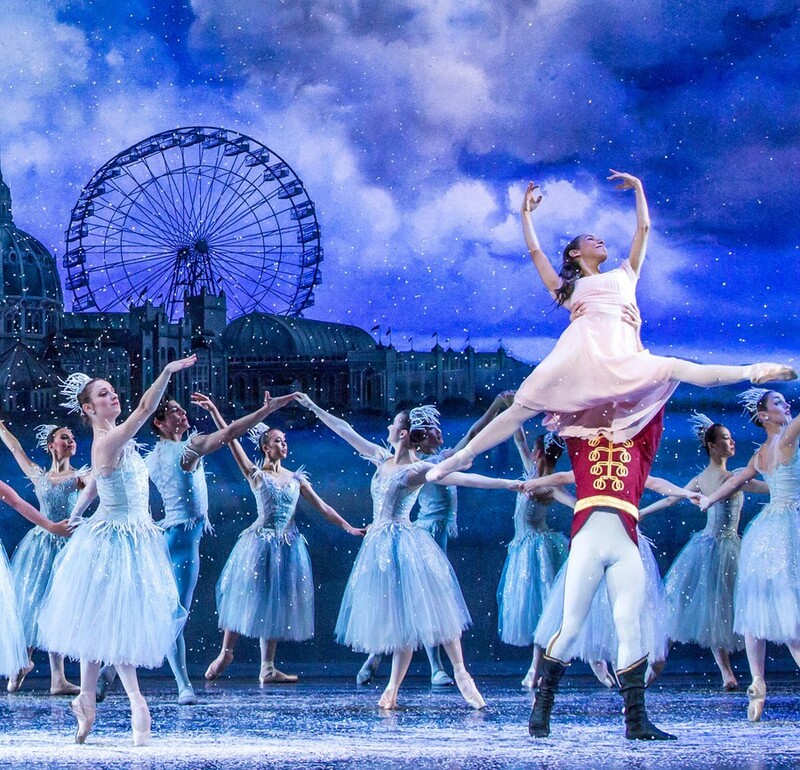 In the past, The Nutcracker has faced accusations of cultural appropriation for such scenes. Stereotypical portrayals of Arabian, Spanish, and Chinese culture that were acceptable in the late 1800s have not aged well in the politically correct culture of the 21st century. I was disappointed to find that there wasn’t much change in these areas, with some blatant stereotypes still paradong across the stage as a means of representing a culture. Keeping the time frame of this adaptation in mind, I would have appreciated a little less leaning on clichés and some more attention to depth. Speaking to my Asian background, the representative props on stage for the Asian pavilion seemed rather superficial and flamboyant. It might have helped to have an Asian dancer performing the Asian pavilion. Besides that, The Nutcracker still accomplishes its ultimate goal: to communicate “the value of love, the need for hope and the comfort of family, no matter where you are from, or what type of family you have,” as expressed by Brian Selznick, story adaptation author and illustrator of children’s books including The Invention of Hugo Cabret. Through its unique background that hits close to home, the humor and wit intertwined in the fusion of history and tradition, as well as the trust and discipline of its ballerinas, Wheeldon’s Nutcracker is a force to be reckoned with. It is a must-see for the Christmas holiday—maybe you’ll walk out with a budding dream, too?